Camo made a hot comeback this year in bold camouflage threads showcasing different colours, straying away from the traditional green on green, green on brown print all over the runways. Kylie just added camo caps to her online shop, selling camo everything from sweatpants to bikinis & even lighters. The print is officially back. The ultimate key to the camouflage print is to keep it minimal & wear it in moderation. Choose one army printed piece & layer it to give it that utilitarian edge. Feminine accessories give camo a touch of fragility from the strengthening power this fabric brings representing clever protection in military tactical history. 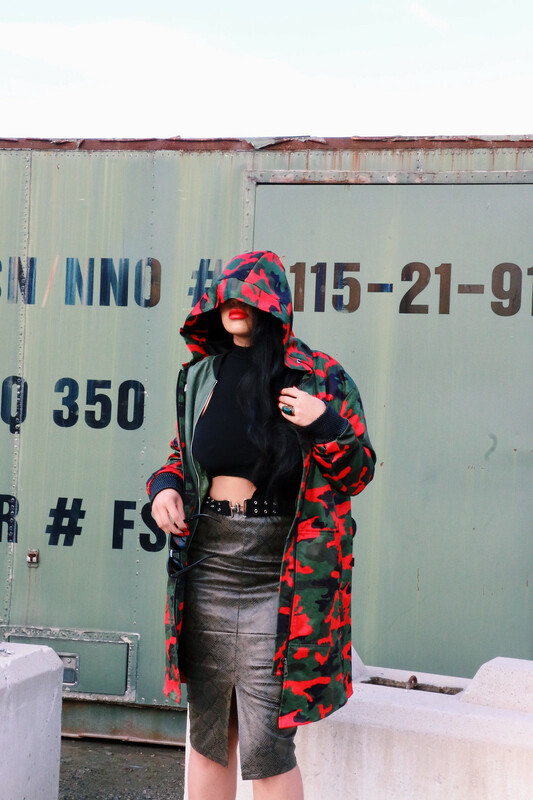 Transformed to fashion today, this look is far from blending in & stand out pieces of army print are in. Camo print is part of the military trend & it is officially a fashion-must-have after Lutz Huelle 2017 Spring Ready-To-Wear showcased a range of colour lined camo print jackets. The interest in menswear is at an all time high for trendy women everywhere with 'oversize' infiltrating all jackets. 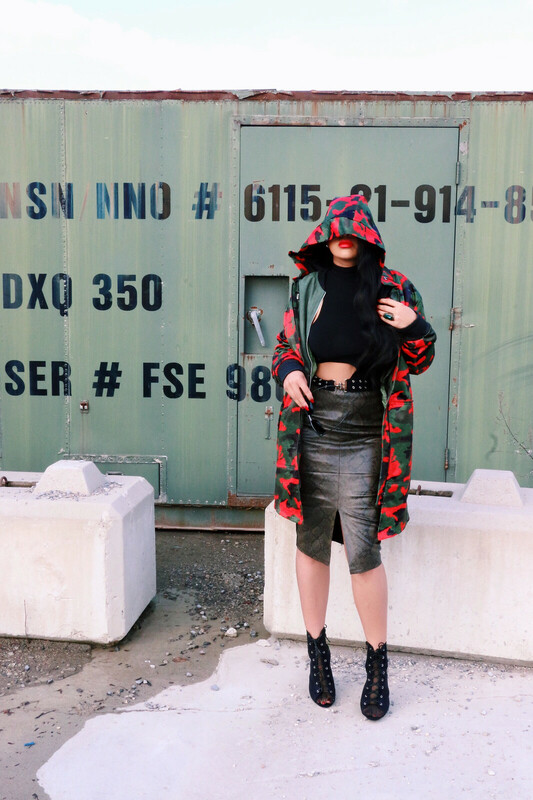 I chose to pair my oversized water-repellent, wind-resistant camouflage Ghost Label ASSASSIN Parka with a vintage buckle turtle-tank with cut outs & nickel grommet features that compliment the grommets on my Simmi Booties, a suede fern green bomber, & my River Island khaki snakeskin split-front pencil skirt. The tailored skirt adds that feminine edge I was talking about. Altuzurra 2017 RTW made the snake skin/python fabric a must-have this season, pairing the textured fabric with different prints as I have done here. Where did I find this military base to shoot; well that's my best kept secret, let's just say I had to camouflage with my backdrop to get in! 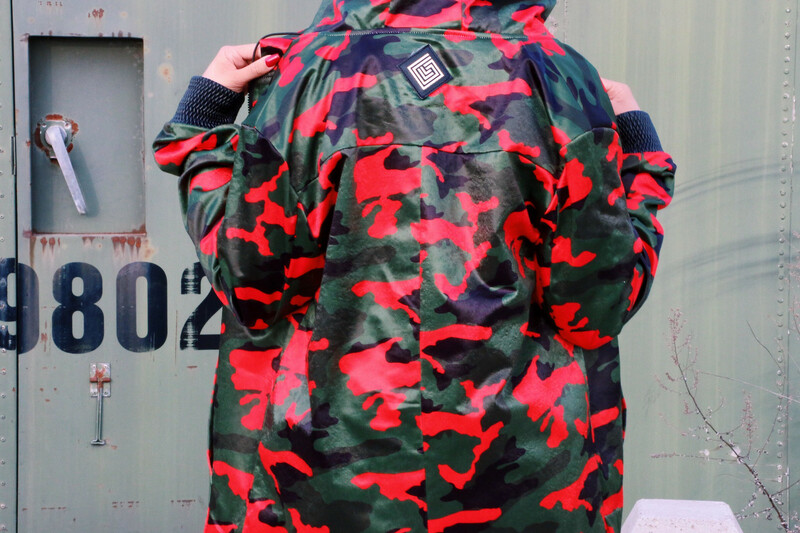 The unique colours of this red & green army makes it a killer statement outerwear piece for that tom-boyish trend. This look is trends on trends on trends. 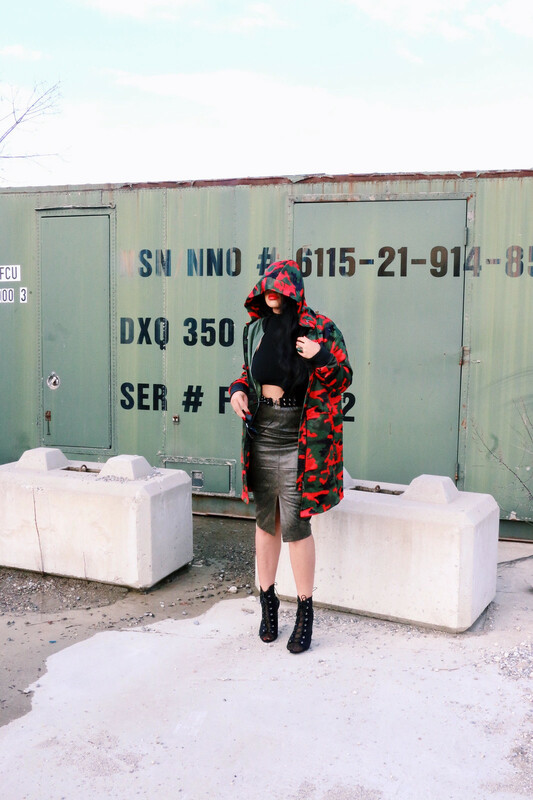 Mesh socks with military ankle booties, layering a bomber jacket with a hoodie, animal prints, unique cut-outs, & camouflage. you are looking so beautiful in these images that you have shared with us. Thanks for sharing this beautiful dress info with us.